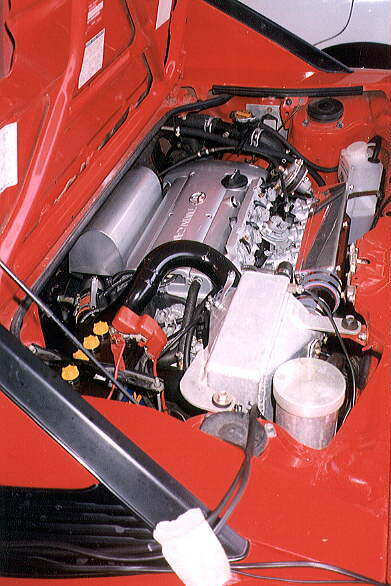 The engines I'm using for my 7A-GZE conversion are my 1996 Corolla's 7A-FE and an AFM-based 4A-GZE from a 1990 Japanese Toyota Levin (AE92). I bought this engine without sensors, harness, ECU, or accessories. Some of you may be wondering why this conversion is taking forever. Well, suffice it to say that I have other priorities currently...but I hope to get back in the game soon. When I do, I don't know if I'll stick with the 4A-GZE I have. If I end up running a programmable ECU, it doesn't matter much if the engine is MAP or AFM...but I'm thinking about importing a complete late MAP-based 4A-GZE, probably from an AE111 (higher stock power rating). Maybe I'll use a 20v head instead...I just don't know at this point. The 300hp turbo idea is quite appealing also! (I talk about it below.) Well, all these ideas will converge one way or another. =) Most likely I'll just put together a 16v 7A-GZE and see where I should go from there...it's a learning process after all. 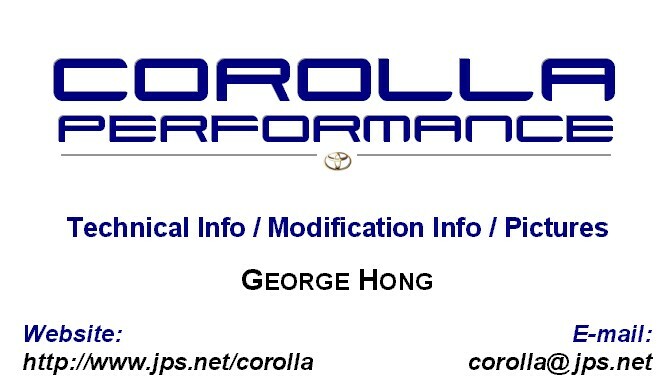 In the meantime, Dirk Apel has compiled some information originating on the Toyota Modifications mailing list about the 7A-GE conversion... corolla@corollaperformance.com (in the UK) has also undertaken a 7A-GZE conversion and is done (and quite content). The following are some posts from him regarding his conversion. 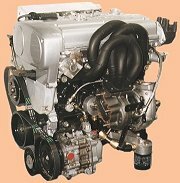 Following his posts is some info on dealing with fueling/ECU issues. Here are also some things you should take note of. 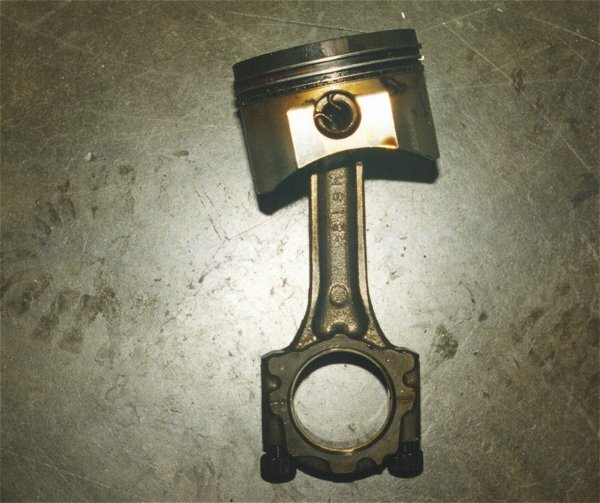 If you're gonna go with forced induction, use forged pistons. The 4A-GZE intercooler may be a bit restrictive...look into getting a larger intercooler. You might ask why I don't just add a turbo and get major BHP figures. Well, I hope to get 200bhp from this lot at 10psi boost without the complication of the SC/turbo installation. Plus most of the parts are still standard and should last as well as be easy to replace. I will use my custom ECU as it did cost 1000 pounds (1500 US dollars) sterling including the wiring loom but it will do anything you want including 8+ injectors, traction control, nitrous + turbo + supercharger, data logging and tuning in real time on a laptop. As I have mentioned before, my ECU uses a timing wheel on the crank, engine RPM and throttle position to create a fuel/ignition map. Boost is not measured as it's directly proportional to crank speed anyway and neither is airflow at the inlet side which does make it quite easy to map. Though for this project I will probably measure air temperature to improve response in all outside atmospheric conditions and improve idling when sitting in traffic in hot conditions. With the long duration cams plus higher boost and longer stroke bottom end, I doubt the the Toyota ECU would get anywhere near with fueling and timing. Well the new pump was fitted (had to take the fuel tank off, unlike later Corollas) which flows 220 litres/hr instead of 120 litres/hr standard. This proved totally successful as they had to take fuel out from all over the map and the injector duration was much better. Also, it cured a misfire at the top end which only appeared after several runs on the dyno as the pressure dropped due to the standard pump failing to keep up. Incidentally, autospeed.com has a list of 100 injectors including most of the Toyota models which lists the GZE injectors at 73bhp each max. Though there is still some fine tuning to do, and we're running rich at the top for safety, my figures are now hovering around 200bhp @ 10psi (7600 RPM). In metric that's 149kW and 230Nm. The reason I say hovering is because the engine is very susceptible to heat, especially with the intercooler on top of the engine. On the rolling road with poor air flow, we always see 1psi (good for another 10bhp?) less than back on the road. Peak torque is around 170 lb-ft, but what's more important is that at 1500 RPM theres 110 lb-ft, and from 2300 RPM - 7000 RPM, there's over 140 lb-ft of torque to play with. Stuff that changed this time include a new half height horizontal flowing radiator with a high performance core and twin half height fans to aid cooling (also required a Ford header/expansion tank as well). My excuse for this mod is that my 10-year-old Toyota radiator was knackered, and I never replace anything without improving as well. I ditched the NipponDenso top mounted intercooler for a Ford Cosworth intercooler in the front grille, hence the half height radiator to get short, straight boost pipes to the front grille. This intercooler easily flows over 200hp without causing much restriction. I changed the rear section of my exhaust to help power, but now I've only got a single 3 inch exit pipe instead of the twin stainless 3 inch exits I had before, but at least it improved power, especially at the wheels. Also, I changed my supercharger for a later model with the smaller pulley which didn't improve top end power by much but has helped to get 15hp more at the wheels at the bottom which will definitely feel better to drive when I finally get it back on the road. While doing all this, we tried several other small mods like different intake designs and final mapping and moving the cams again. Anyway, from all this playing, we have come to the conclusion that without adding a turbo to blow air through the throttle butterfly, this will be the last mod needed to gain the full potential. 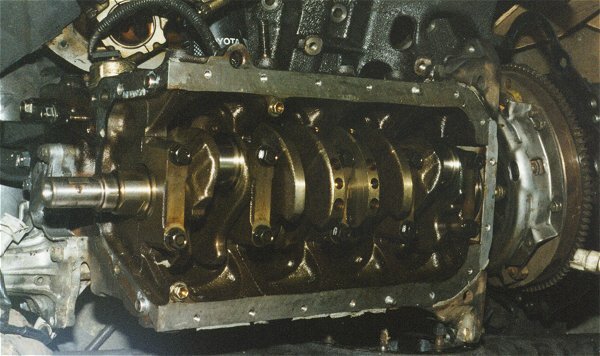 Basically, a car on quad throttle bodies breathes through 4 x 45mm holes compared to 1 x 47mm on the GZE (the SC can only help so much in sucking air through it). As an example, by paring down the butterfly spindle to gain that little bit more gap at wide open throttle, we gained 5hp. So I'm looking to machine the throttle body out to, say, 55mm. I guess you want some figures, well how about 210hp @ 7500 RPM, and my car consistently gives 200+ readings whereas before, after a few runs the heat soak in the engine and intercooler would slowly decrease the power output. Dealing with fueling and the ECU is a significant part in this conversion. The following information draws from advice provided by Gary M.
Stock ECUs are very carefully programmed for the stock engine. 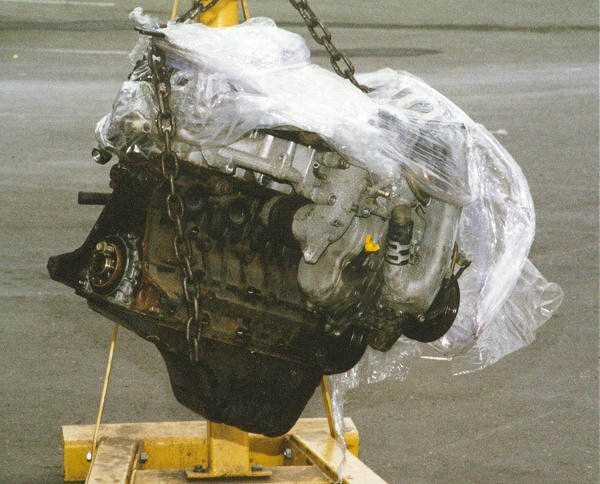 In putting together a 7A-GE, you have a number of decisions to make regarding the ECU. The 7A-FE's stock MAP ECU could make more power due to the lack of intake restriction, but the Volumetric Efficiency difference between the two motors will make it run like crap unless the ECU is reprogrammed to work with the better flowing head. With a MAP based system, when you change the VE of the motor, the ECU will not add the right amount of fuel. A fuel pressure riser (to add more fuel), like the one Stillen sells, along with a standard adjustable regulator in place of the stock one (to move the fuel curve) may get you close, but the VE curves will never match, so you will have rich areas and possibly lean ones too. A bit rich for part of the rev range is not too bad as long as it is not so bad that it kills the cat and O2 sensor. If you start going with bigger cams though, it may get tough. The 4A-G(Z)E AFM ECU, on the other hand, will respond to greater airflow with more fuel. It will only need some adjustments to the AFM to get the fuel curve near perfect, but you'll have to live with the restriction of the meter to make it work. If you're willing to accept the cost, a programmable ECU would be the best way to go. With it, you can set the fuel/ignition map as you deem appropriate, and it will allow for further mods at any time. The 7A-FE injectors should flow enough for a 7A-GE, but as you shoot for more power, you'll need larger injectors. Ray Hall of Ray Hall Turbocharging took a somewhat different route, the end result being very impressive. 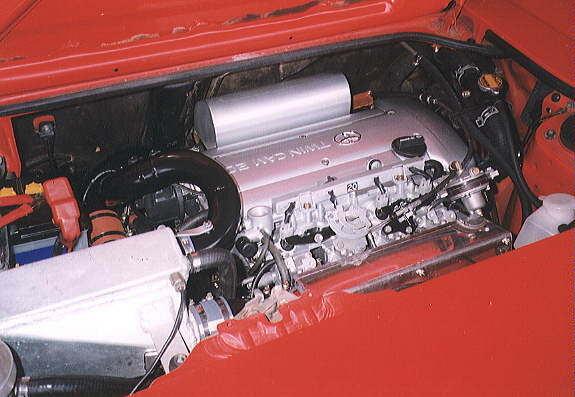 In brief, he put together a 300hp 20v 7A-GTE! This beauty, which unfortunately is only a one-shot deal (Ray: "It was made in my spare time, and I am not looking to make another one at the moment. 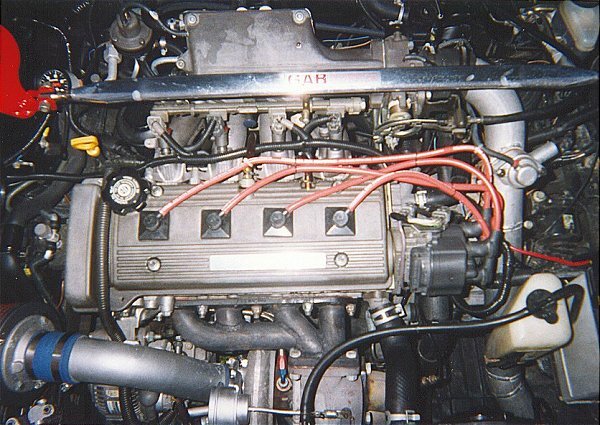 "), was fitted into a 1987 AW11 MR2. Note that it should also fit into an AE102. 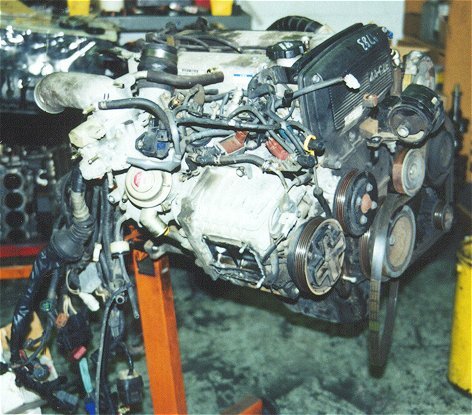 "The engine fitted into the AW11 MR2 without any problems. 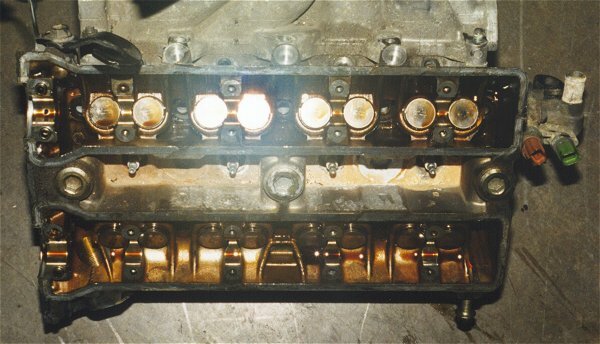 The only major change was to the way the engine coolant flows through the engine; it was changed to flow through the block first and then the cylinder head. The intercooler is from a Suzuki 4WD and is mounted under the gearbox at a 15 degree angle to direct air into it from under the car. 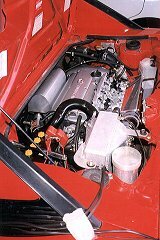 Fuel injection is controlled by an Autronic Smc sequential, replacing the original ECU. 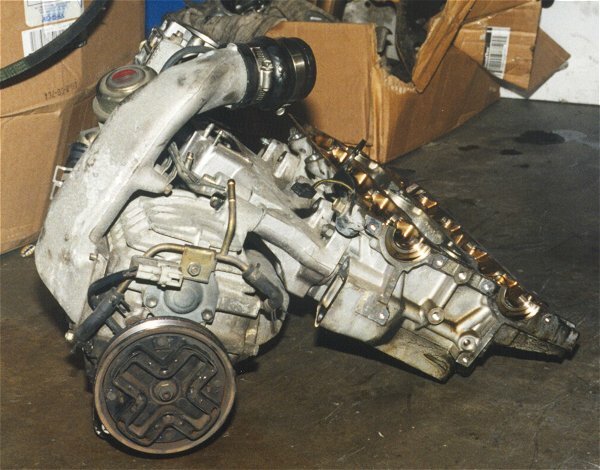 The injectors are from a Turbo Sport Celica. Boost starts at 1000 rpm...maximum boost is achieved at 2700 rpm. The engine pulls strong from 1500 rpm to 4000 rpm, and from 4000 rpm to 7400 rpm...hang on!" 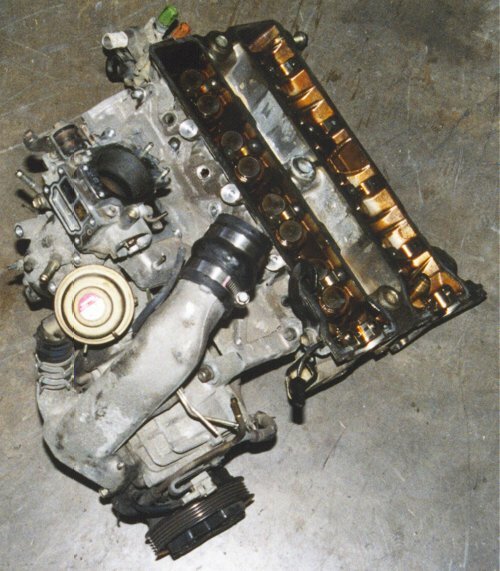 If a 16v G head is used, a Porsche 924 timing belt will suit the job. The 20v head, however, apparently requires a different length belt. 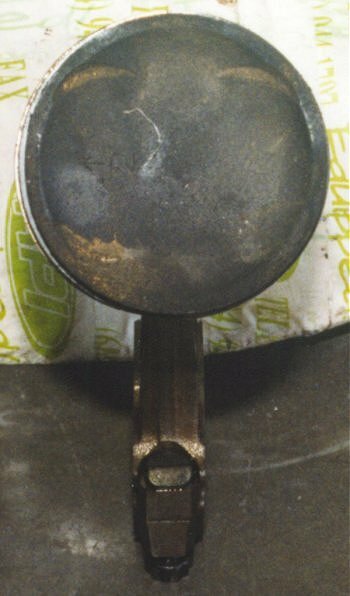 Ray couldn't find a correct length belt, so he had to reduce the diameter of the idler pulley. 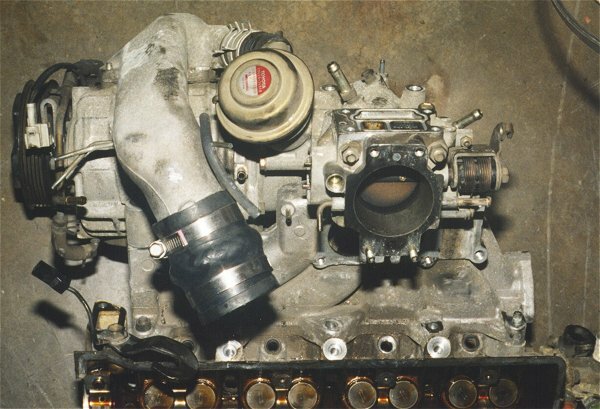 If you want, you can skip the head conversion and just turbo the 7A-FE (resulting in a 7A-FTE), like Roy of PSI Racing did. The F head is actually quite good for turbocharging. 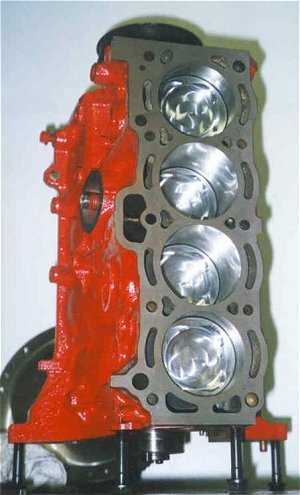 The smaller valve angle could make boost come on at a lower rpm and will make more power for a given amount of air/fuel mixture burned. It can't be pushed as hard as a G head, but for a modest boost street engine, the F heads might actually be better suited for turbocharging. The following is a picture of Roy's nice turbo setup. Check out the intercooler in front. =) At last check, Roy was running 15psi of boost and doing the 1/4-mile in 14.4 @ 98mph before he cracked a piston. The damage is not stopping him...he's rebuilding and improving with his sights set on the 12 second mark. You can find out more about Roy's setup by emailing him or by going to the writeup at Corolla Style.